During our holiday in Melbourne, we had the opportunity to check out Collins Kitchen at the Grand Hyatt. The name Collins Kitchen might bring about a rather casual restaurant image in your mind, but it is actually a pretty contemporary looking restaurant with an ultra high ceiling and an enormous kitchen in full view of the restaurant. While we were there, Burn City Smokers was helming the kitchen and they will be there until the end of November. Burn City Smokers, as their name suggests, are experts in the art of smoking with wood, combining traditional techniques with modern flavour and style. 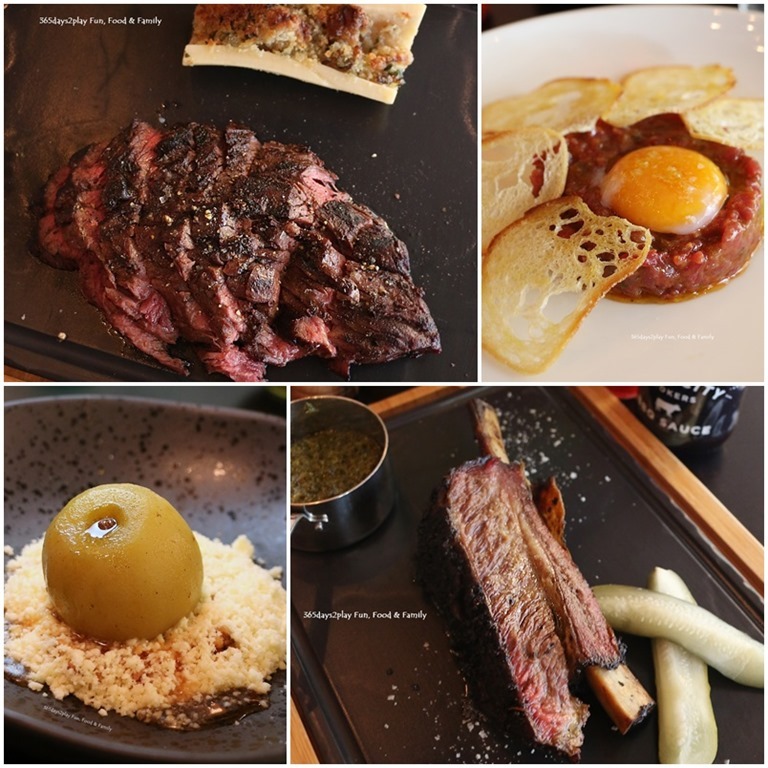 Their menu for Collins Kitchen include Tasmanian free range baby back pork ribs, smoked lamb rump, pork scratchings, corn bread and popcorn ice cream sandwiches. Basically all the good stuff that will leave you feeling like you’ve just been to a traditional Southern American barbecue. 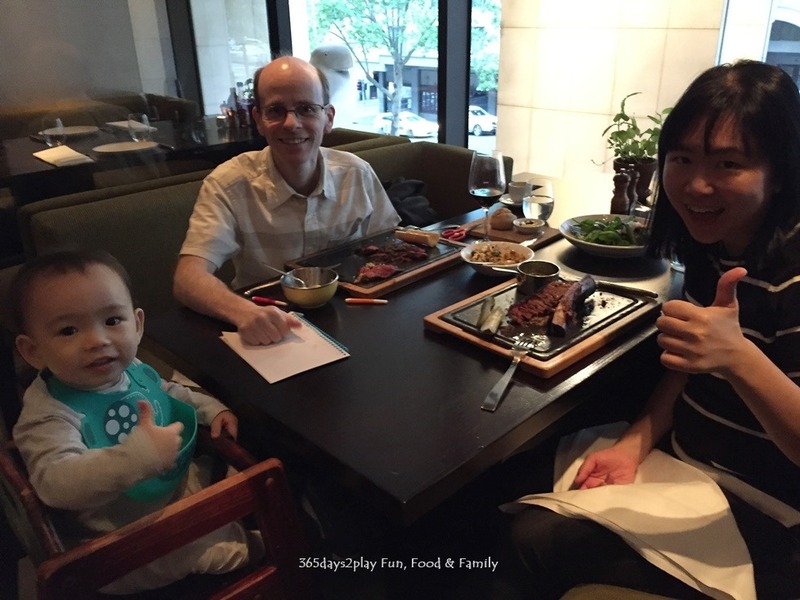 The 3 of us were very impressed with the food, the ambience and the service. We managed to get a nice booth seat next to the windows so we felt like we were in our own little world, even though the restaurant was packed since it was Melbourne Cup day. Speaking of which, all the ladies were dressed to the nines, with their fascinators and all. Aside from the spring salad which was a little difficult to eat (too many long stems), we enjoyed all the dishes that we ordered. The meats were fabulous as expected. The hanger steak had beautiful flavour while my 8 hour smoked beef short ribs was bone tender and very rich tasting. It might actually be a good idea to share this, because a little goes a long way! More than once during the meal, and during the course of my holiday, I mentioned to the Partner that we should plan another visit to Collins Kitchen. Great pricing (this meal would probably have cost much more in Singapore!) and a great experience, alas we just didn’t have time during our trip! Is Melbourne Baby/Toddler Friendly for tourists with children? Parents with young children often wonder if a country or city that they’re travelling to is baby or toddler-friendly. Just check the mommy forums online and you will know that this is a perennial question. And rightly so too. I mean if your baby or toddler is already a handful in Singapore, the last thing you want is to be unprepared and ill-equipped in a foreign location. It’s very easy for bystanders to say “go with the flow, it’s a holiday!”, but if it’s an issue that you have to face every single day of your trip, it will take its toll. We just returned from Melbourne last week. Prior to visiting, I had been told that Melbourne is pretty baby-friendly. My biggest concern before going was how to let Baby nap comfortably, and whether the streets would be stroller-friendly. I wasn’t too concerned food-wise because Baby loves his food, and also Melbourne seems clean enough. On the whole, we had a pretty good 10 day holiday in Melbourne, yes 10 days entirely in Melbourne city. Is Melbourne baby / toddler-friendly? Here’s what I found out. 1. 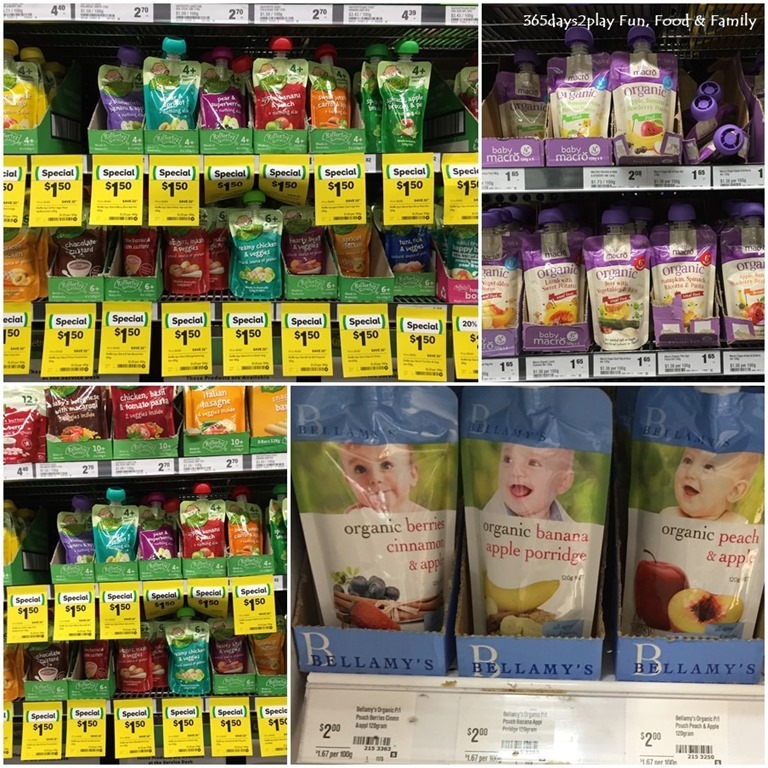 Baby food is super affordable in Melbourne! So cheap! 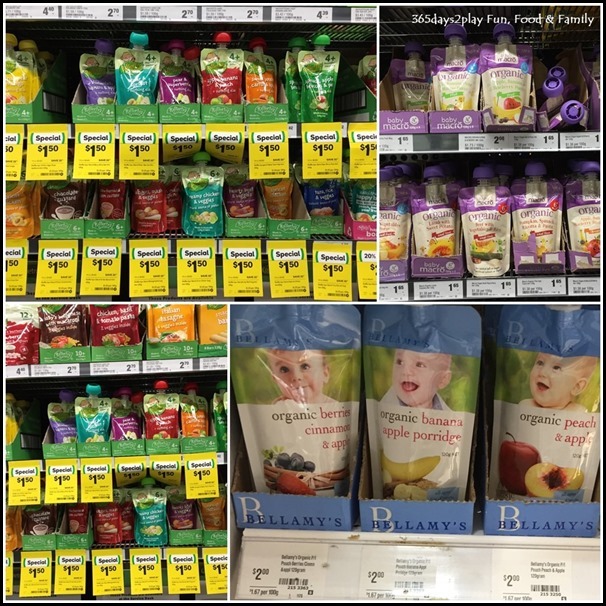 $1.50 for Rafferty’s Garden, $1.65 for Macro’s Organic and $2 for Bellamy’s!! Hello people! If you’re wondering why I haven’t been posting this week, it’s because I’m now currently holidaying in Melbourne! For more current updates, you can follow me on Instagram or Facebook. Meanwhile, here are some pictures for your viewing pleasure! [Ganache Chocolate] Super delicious iced chocolate that was richly chocolatey and came with a scoop of ice cream and chocolate flakes. Aud$7.20 seems so value for money considering that many watered down versions also cost this much. . Best part is, the store is just a 3 steps from my hotel, so it means I can visit again before I return to Singapore. Or I could visit the Lindt Cafe that is 6 steps from my hotel. Really love the location of my hotel on Collins Street!! Good morning people! Going to the zoo later! Although I only visited the Singapore Zoo a few weeks ago, we’ll still go to the Melbourne Zoo to enjoy a Zoo visit in cool weather!! Omg the abalone is alive!!!! When in Melbourne you have to visit the historic State Library of Victoria to snap this iconic shot. Sure, modern buildings may look nice too, but will they have the timeless appeal 100 years from now? . Btw I didn’t come here just to snap this picture. We brought @edward365 to attend the Baby Bounce songs and reading programme. We love attending the ones in Singapore at @publiclibrarysg so why not when on holiday too. Did the same in Auckland too! Literally cake street! Every few shops is a cake shop with a display full of cakes! I really wanted to try everything!!!! So hard to decide which cake to have!